Fun, Frugal, And Meaningful Wedding Gift! I have decided to do a series on fun, frugal and meaningful gift ideas. For me it seems this time of year is filled with more gift giving occasions than any other, short of Christmas! There are tons of birthday parties of course, and Graduations, Going Away To College, Weddings, Baby Showers, and more! So, what better time to discuss some great gifts you can give? I will have to begin by saying almost all of these ideas are shamelessly stolen straight from my Mother! She is the ultimate gift giver and card sender! Since there are many summer weddings, let’s start there. This particular gift was one I loved so much, she even gave it to me for my wedding. I looked forward to the day I got married and received one. She would hand pick a goblet, not one from the Bride’s registry, just one she felt was unique and could stand alone. This is such a great gift, like I said my Mother is a great gift-giver. I placed mine in a curio cabinet with the card standing in front of it. You can find a great single goblet for not much money almost anywhere. I have seen great ones at T.J. Maxx and even a second hand store or garage sale! Just look around and be creative. Remember, it’s the thought behind the gift that counts! This is what I call a great fun, frugal, meaningful gift! Thanks Mom! So, I will be doing a few of these fun, frugal and meaningful gift ideas over the coming days. 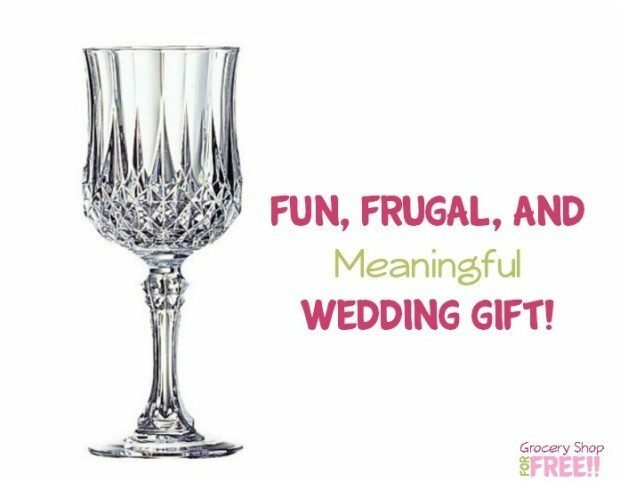 Time for you to share your fun, frugal, and meaningful wedding gift ideas with us!